← Blu-Ray News #136: The Noose Hangs High (1948). 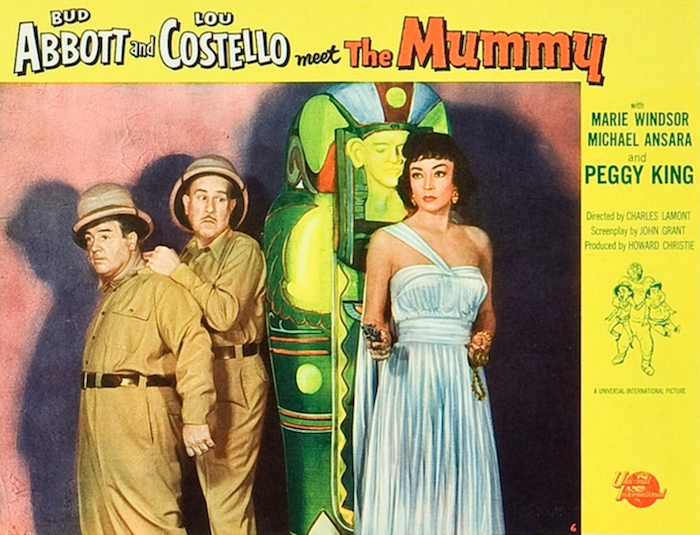 Blu-Ray News #137: Abbott & Costello Meet The Mummy (1955). Another day, another Abbott & Costello movie on Blu-Ray. This time, it’s Abbott & Costello Meet The Mummy (1955), their last picture for Universal (and their last monster meeting). It’s already available in hi-def as part of Universal’s The Mummy Complete Legacy Collection. Meet The Mummy features Marie Windsor, my all-time favorite actress. Eddie Parker, Lon Chaney’s double on the three previous Mummy movies, plays Klaris throughout this one. The scene where Costello eats a hamburger with an ancient medallion hidden in it had me in hysterics as a kid. The 1.85 transfer, which I’m sure will be the same one in the Legacy set, splendidly shows off the picture’s backlot and soundstage version of Egypt. Nowhere near the team’s best, but highly recommended anyway.